Mayor Rahm Emanuel and City Clerk Anna M. Valencia announced that Coast2Coast Rx has been selected as the vendor to provide discounts on name brand and generic prescription drugs at no direct cost to the City or participating Chicago residents. Starting this week, residents will be able to take advantage of the free benefit by using a discount card available at www.ChicagoRxCard.com, public library branches or many aldermanic offices. Additionally, CityKey cards that are issued going forward will include a discount number so that the CityKey can also be used as a resident’s prescription benefit card. 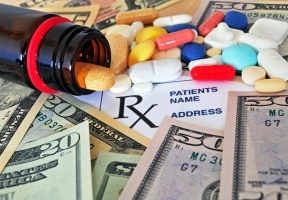 The City, in partnership with Coast2Coast, unveiled a new website www.ChicagoRxCard.com that allows residents to locate participating pharmacies and search for the price of prescription drugs, medical equipment, and even medication for their pets. The Chicago Rx Card will be accepted at all major chain pharmacies in addition to many independent ones. Over 60,000 drugs are included as part of the program with savings of up to 80 percent on both name brand and generic prescriptions. One card can be used for dependents for an entire family and is good for pet prescriptions as well when they are filled at a pharmacy. There are no limits to the number of times the card can be used. 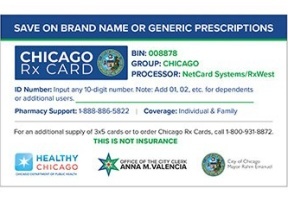 The Chicago Rx Card is not insurance and is not intended to replace insurance.